In the beginning, there was nothing. After nothing, there was some type of green slime that derived from an old woman who lived in a shoe. Then, twenty thousand year after shoe-woman smile, reality television came along, and society died. What? You don’t believe me? 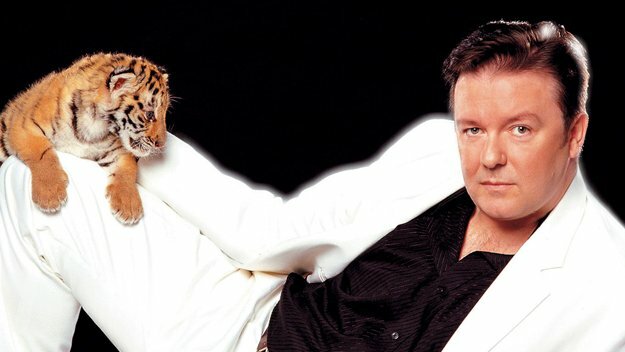 Just ask Ricky Gervais in his 60 minutes stand-up show, that he performed in 2010. English comic, Ricky Gervais, trundles onto the stage accompanied by the theme of ‘CSI: Miami’, before he regales his audience on a tale about his bad back, and then calls them all a bunch of ‘c*nts’. Obviously, no offence was meant by this latter remark, which is why he then proceeds to tackle such subjects as: (1) The delay that he avoided due to an ash cloud in Iceland. (2) The definition of ‘an act of God’. (3) The recession – he thinks. (4) Comparing fat-people to homosexuality. (5) Susan Boyle. (6) An alternate view of Noah’s Arch. And (7) His views on life, personal history, and the reason why he called his science-less show ‘Science’. Moreover, there is also the usual Ricky Gervais trademark delivery, which can on occasion be warm, brash, smug, and most importantly, honest. On Iceland – “They should tarmac the whole place and make it into a car park for real Europe”. On How Insurance Companies Know If An Event Is An Act Of God – “How the f*ck do they know? Do they have a hot-line and ring God up on the phone?”. On Fat People – “Listen, no one got fat behind their own backs”. On Drink Driving – “It’s a bad thing – and I am ashamed of doing it because I almost killed an old woman once. Don’t worry, I did not run her over – I raped her instead”. On Spiders – “They are not like cats – because you will never see a spider laid out on the floor and relaxing”. On God – “No – he’s not gay”. His Testing The Water Joke – “Why did the little girl fall off of her swing? She had no arms”. On Science – “It is fear that threatens rational thought”. As soon as Ricky finishes his act, he takes a bow, says something funny, and then trundles off once more. Now Ricky Gervais is the type of comedian that I would define as being of ‘the acquired taste’. Well, for me, I find that his comedy does come from the instances in-between jokes, such as the gaps in which awkwardness sets in, and you are unsure if what he is saying is meant as being jovial or not. Personally speaking, a prime example of this would be this stand-up comedy performance, ‘Ricky Gervais: Science’, where the Reading rascal defines his whole comedy act, by defying the sub-title of his show – Science. OK, I can understand why some people would not find this particularly innovative – as it may appear that Ricky was lazy in writing his routine, and strayed with topics of his own devising. However, if you sat back and thought about it for a moment, you would come to realise that the subjects that Ricky relays in this show – like life, weight, genetics, and personality – are all related to the aforementioned title in one way of the other, even if it is done in a rather subjective manner. Now I think that this says more about Ricky’s humor than the humor itself – because it shows that the man is a deep thinker, even though his ‘outlet’ appears generally smug and bold. Granted, Ricky hides this facet about himself very well within his performance, and cloaks his deep nature with his roguish ramblings that can appear quite offensive at times. “So why does he do this?” you may wonder. Why does Ricky hide his intellect with coy comments and rank remarks? Well, he is a comedian isn’t he? And like most comedians, the only way that he can perceive existence is through a satirical lens that is one half personal and one half clown. I am sure that nigh on most of the things that Ricky comes out with is from an instinctive nature that is purely his own. And this shows too in this comedy routine, in which he takes instance from his own life – like the ‘Noah’ book, or the ‘crude joke’ – gives them his own spin, and then presents them for all to see no holds barred. Moreover, Ricky does try to balance out the formal with the informal – as on occasion he does appear to be talking straight from the head and not from the funny bone. 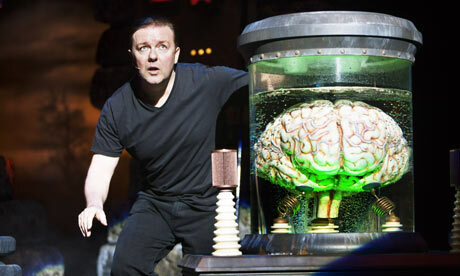 Overall, ‘Ricky Gervais: Science’ is not a bad comedy performance. And even though I do feel that it is one for people who are not easily offended, alternatively, I surmise that it is for people who share Ricky’s same comedic leanings as well. For me, honestly, I did not mind it one bit – as some of Ricky’s stuff was ‘laugh out loud’ funny (mainly in the latter half of his show), whilst some of his other stuff was mealy amusing at best (partially his smugness). Therefore, if you like stand-up comics who are not afraid to say what they mean and mean what they say, plus, like the sight of a rather menacing looking dwarf on stage (well he does), then this is a show for you. Nice program – but of the ‘alternate’ variety.